Beautiful high quality interlock merino wool swaddle made in USA. Swaddle Blanket 28"x30". Okeo Tex Merino wool. Made in USA. Made of Okeo Tex Merino wool. No polyester, no vinyl. Simple, 1 layer, serged edges, interlock knit. Soft "feels like cotton" stretchy knit wool. 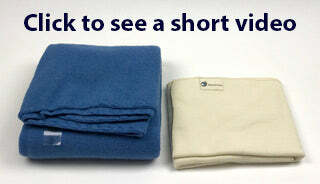 Sizes are approximately 17"x28" before shrinkage for the changing mat, and 28"x30" for the swaddle blanket. Although we recommend hand washing all wool, it can be machine washed on gentle, lay flat to dry. It is a lovely changing pad, but it's so lovely you might use it for more than that. Use it as a newborn baby wrap up or get the larger one for a bigger wrap up. It might even become baby's favorite blanket to carry around. Or use it as a pad to keep the family bed dry. It's lovely wool. And after you are all done using it as a changing pad, remake it into something else (or even buy one for the purpose of custom sewing your own merino wool cover). Wool lovers will enjoy having this nice organic merino wool, no matter what you use it for. Made in USA. 8 weeks old, 9.5 pounds enjoying her swaddle blanket before mom wraps her in it over her Workhorse size newborn diaper without a cover. The wool blanket will serve as a wool "cover" for going coverless while mom feeds her. It's snuggly to be able to go without a diaper cover for a while. A folded Babee Greens Wool Swaddle Blanket. A short video which shows the Babee Greens Swaddle Blanket next to a Disana Boiled Wool Children's Blanket. This is the softest, coziest blanket. It feels so nice to wrap up my children in such a beautiful and warm blanket. I bought one two years ago for my youngest and she still uses it. I bought another for my newborn. I wash it occasionally, but being wool, it doesn’t ever really seem to need cleaning. I bought this blanket for my 3 month old as his special blanket. Pros: It is so cozy, soft and warm! It's so nice. Breathable Thin (and very warm) Nice size for young child (mine is wearing size 12 mon clothes) Cons: I tugged on the side of it too hard and pulled the cotton edge stitching out, so be careful with it. We love this blanket (large size one) and use it all the time from birth till now (3 months old). We love this blanket (large size one) and use it all the time from birth till now (3 months old). Our baby was born in the winter and the cotton blankets weren't warm enough and the synthetic ones were too stuffy and hot. Wool is the best, warm and breathable, keeping baby at a very comfortable temperature. We wash it once a month, and spot clean it when needed. It dries very fast and doesn't need much care. It is perfect for someone who wants something simple and low maintenance. Though it is called a Swaddle blanket, I wouldn't recommend it for swaddling as it is stretchy and hard to get tight on baby, but it is a wonderful blanket, play mat, changing pad, burp cloth (when you forgot yours at home). This is one of our "baby must haves". I purchased this swaddling blanket several months ago. I purchased this swaddling blanket several months ago. We share the bed with our infant. In a feeble attempt to spare our bedding, I would lay a folded cotton receiving blanket under my breast to feed the baby. Since my supply is plentiful and I have a forceful letdown it nearly always leaked through the blanket and onto the sheets. It was exhausting washing sheets all the time. After suffering through it for the last 9 years I "splurged" and bought this blanket. I would have gladly paid double for it!!! I lay it under me and the baby, toped with a single thickness receiving blanket (to absorb the puddle of milk), and it never leaks through!!! I have used it without the cotton blanket on top and still no leaks (the milk will just bead up on the top). One of my all time favorite purchases! The wool is so soft, if I had another to spare, I would not hesitate to use it as a blanket as well. The blanket is soft, breathable, warm and stretchy. The blanket is soft, breathable, warm and stretchy. We having been using the larger sized blanket everyday since we had our daughter six weeks ago. It's my go-to blanket for use with the car seat or as an outer layer for swaddling. Now that it is summer I still use it at night to keep her feet warm. I love natural fabrics and wool. I'm super happy I decided to get this even though at the time it felt like a splurge.